About Roger My enthusiasm for woodcarving began in the late 1980's while a student in California. At first I carved small, voluptuous, highly finished figures, inspired by the ancient Greeks and modern masters such as Gaston Lachaise and Eli Nadelman. Since that time my carvings have become larger and more quickly rendered. This shift reflects my deepening understanding of the tools and the process of woodcarving and appreciation for rustic folk art traditions. The carvings of the Japanese master, Enku, demonstrate just how much can be achieved by the simplest and most direct means. To this end I have streamlined my sculpting process, favoring immediacy. I have had the good fortune of studying with master carvers in many parts of the world. My earliest inspirations were Caribbean woodcarvers, including the premiere Jamaican artist, Christopher Gonzales, and my first woodcarving instructor, the Panamanian born artist, Barrington MacLean. As a student at UC Santa Cruz I came under the influence of sculptor Jack Zajac. After college I toured Japan to get a firsthand glimpse of that country's astounding woodcarving heritage. While in Nara I was instructed by Koyo Taketani, a carver of traditional wooden dolls, who gave me my very first Japanese laminated steel carving tool. I use the mallet he made for me and inscribed with both our names every time I carve. My love of woodcarving has led me to try other forms of carving. I spent a week in the village of Bernard Matemera, Zimbabwe's late cultural hero, marveling at and absorbing his stone carving technique. Another time, when I was asked ..wouldn't I like to carve at the World Ice Art Championships in Fairbanks, AK, I responded: "...Absolutely!" 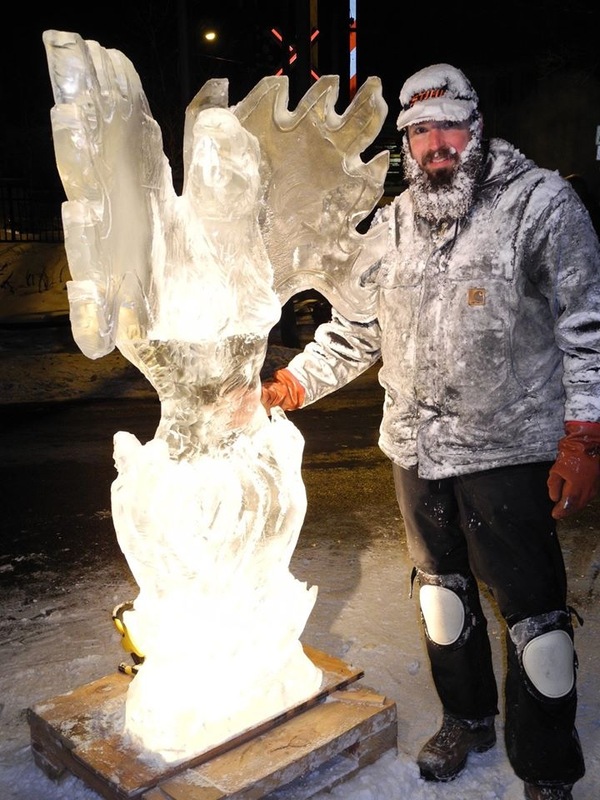 Since that time I have led my own forth and fifth place teams in the Multi-Block division of the World Championships, twice contended to represent the US in Olympic Ice Carving, carved in regional competitions, and executed commissioned ice carvings. I got my first taste of stone carving while in Zimbabwe, however it wasn't until I was invited to the Italian studio of the California artist, Manuel Neri, that I was truly bitten by the marble carving bug. My first glimpse of the snow-white quarry tailings along the Carrara ridgeline was thrilling. For two summers I tramped in the footsteps of Michelangelo, visiting the working ateliers, quarries, and tool manufacturers, and carving alongside Neri. In 2012 I moved with my wife and children to Powelton Village in West Philadelphia.